I just want to make double sure that the flashing lights (green front wheels) while driving in 2H (rear wheels lights are steady) is not a major problem? I have a 1999 3000 V6 SWB. When i put it in 4H the green lights are all steady, but the front wheels are flashing as soon as i put it back in 2H. We are going to do the Namakwa Eco Trial next week Thursdag for 8 nights, and i would like to know if i can go on the trip with the lights flashing?? Hope someone can reply as soon as possible. leave it 4H on tar. Use the 4HLc and 4LLc when going off road. Replace the vacuum solenoids (and possibly the front diff sensor) when you get back. Thank you Marius for your quick reply. Just hope it wont cost a fortune to replace it. both solenoids and the switch should come in under R1000 altogether. A lesson that i learned to come to a complete standstill, put the main gear into neutral (i have an auto)select 4H or any option, then start moving again. Since doing this, the "flashing" times have greatly reduced. Aparantly, this allow the system to engage / disengage more effiently. Perhaps this could save you a cost.. I am new to this forum and this is my first post. I have recently purchased a 2002 3.2DID SWB Paj with 184000km on the clock. Love the vehicle! However I have a problem with the super select/transfer case. When I start the car 3 of the green lights (2 back and front right) come on for a few seconds only to die and never come on again no matter what I do with the transfer lever. I see a lot of comments on flashing lights, but I have no lights. The previous owner I bought the paj from never took it off-road and very seldomly engaged 4x4. It seems as though the paj is stuck in 4H and won't shift to other modes, no matter what I do with the transfer lever. I found this, because trying to go up a sandy hill the front and back wheels were spinning, even in 2H. So now the paj is at the dealer and they quoted me to replace "freewheel clutch solenoids and front diff actuator and 4x4 detection switches, to diagnose further". Do you think this will solve the problem and are these replacements necessary? Unfortunately the parts have to come from Japan, which means a long wait. I have minimal technical knowledge about cars, but is there anything I can do to try and solve the problem before handing over the money to the dealers? They are probably correct about the parts to replace. I've replaced the solenoids and sensors and it solved all the problems I had. The only part I doubt needs replacement is the actuator. It probably only needs a good cleaning and some proper lubrication. They get stuck if not used. The only thing that's bothering me is the fact that you have no lights showing. The most likely explanation is that the one front green light and the centre orange light bulbs are broken. You should see all 6 (4 wheels, centre diff and rear diff) lights light up when starting the car. After starting, the centre orange light is probably flickering, but you cannot see it as the bulb isn't working. What is the actuator and what is its function? Does anybody have a pic or figure where I can see where it is? Like most of us here my lady also have the disco lights syndrome. But only for 2H and 4H. The rest works fine. Gryskoos wrote: What is the actuator and what is its function? The system is a remarkable system and there has been various troubleshooting threads on blogs and forums all over the world. Some of which I put together but I realised that troubleshooters lacked one thing - the troubleshooter did not understand how the system works so I have put the system out below. Before we go into the detail I will explain the system in a nutshell. When the transfer lever is moved, a sensor in the gearbox picks this up and relays the message to 4x4 ecu. The 4x4 ecu then sends the signal to vacuum solenoids who, in turn, sends the vacuum to the front diff actuator (to engage the front diff to the right front side shaft). The transfer case mechanism is completely mechanically operated by the transfer lever in the Gen2 models. In Gen3 and later models with the electric 4x4 control, the 4x4 ecu also sends the signal to actuators in the gearbox to engage the necessary mechanical linkages. This is a broad location finder picture of the front diff. It should look almost identical through all the different years and generations of pajeros and colt pickups. The actuation of the shaft is done by vacuum. 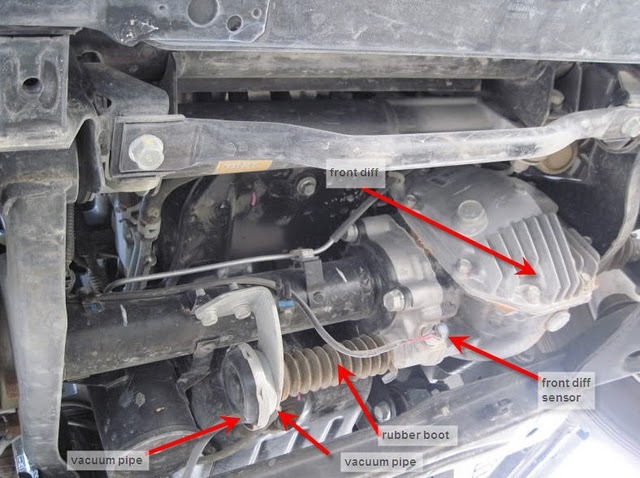 If you look to the left (as if standing in front of the car) of the boot that covers the actuator shaft on the front diff, you will see a diaphragm with two vacuum hoses attached to it. When the vehicle is in 2H the vacuum pipe that exits towards the rear of the vehicle should be pulling vacuum and when the car is NOT in 2H the other vacuum pipe should be pulling vacuum. EDIT : When the car is in 2H there should be 12v over BOTH the two connector points on the brown connector. When NOT in 2H there should be NO 12v on either connector.